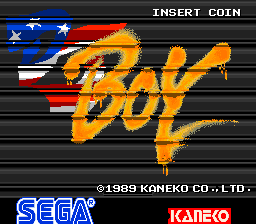 DJ Boy (ＤＪボーイ) is a 1989 arcade beat-'em-up by Kaneko running on Kaneko-designed hardware and distributed by Sega in Japan and American Sammy elsewhere. Sega and Kaneko ported it to the Sega Mega Drive in 1990. You play as a kid on rollerskates beating up enemies in various auto-scrolling environments. punches (lower range, fast timing), kicks (higher range, slow timing), and jumps, with a variety of combo moves in between. The original Arcade verison have a number of lifes (you lose one by taking two hits) and a more stiff gameplay. The Mega Drive version instead, have a heath bar without extra lifes and continues. In the Japanese version of the Mega Drive port, the protagonist must save a girl. In other versions, he instead must recover his stolen radio. In Western releases, recurring opponent "Big Momma" was given a skin colour change (she throw donuts instead of farting), presumably to avoid depicting black stereotypes. Another boss that was changed is the final one (she became brunette instead of black). The last two entries (Special Thanks and Inter State) are absent from international versions. Main article: DJ Boy/Magazine articles.